When your turn begins, the Runner draws 1 card, then you may gain 1credit for every 2 cards in the grip. "Welcome to Azmari Mail! You have 4,196 unread messages." Seems of dubious use. 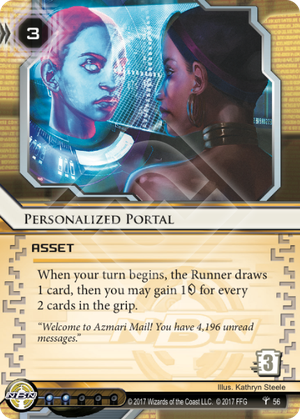 Best case scenario, you rez at the end of the Runner's turn and they have a full grip. Then, you gain 3 credits -- breaking even. I guess you could pair it with Palana Agroplex.